Fits perfect and came in fast with great communication. Highly recommended. very fast shipper!! would definitely buy again from them. Fast shipping and great communication from seller. A+ experience. Wow, was quick to receive. Amazingly fast. 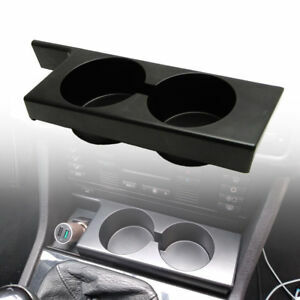 These are the cup holders the car should have came with. One of the holes is big enough for a can of soda. The other will fit a large McDonald’s cup easily. excellent quality,was thinking about it ,but super happy i got it,looks great too.i removed the two screws from oem broken cup holder and put this one in its place. Fits perfectly with the console. Looks good and great product. Waited a long time for one that works! Finally! One that works! I had a 'new & improved one' that still left my drinks in my lap when I took off. This works! Holds drinks firmly & securely. Fits in the space well, but does block fan controls when in use. Still a good addtion.